The “Air Head” Composting Toilet works simply. By separating liquids from solids, the volume of solid human matter is significantly reduced. Air Head’s approximate five-gallon capacity means that up to a season’s worth of weekend use may be held. (Based on solid matter volume for two persons’ use twice every weekend for five months: 80 uses). A liveaboard couple can expect 60 uses (one month) before they’ll have to empty the solids tank. 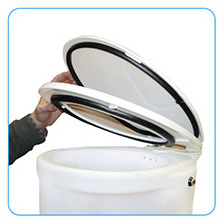 Much like a household toilet the “Air Head” Composting Toilet has a bowl and an actuator which provides a “flush.” The main difference is the “Air Head” Holding Toilet’s waterless operation. A paper bowl liner acts as a carrier for solid matter on its way to the solids tank. The solid matter is separated and agitated, thereby decomposing it into a non-offensive state inside the large tank. Additionally, the unit has an integral 12-volt fan that provides a constant negative pressure to pull moisture out of the living space. Even after long lay-ups, there is no “holding tank” smell when you come aboard. Liquids are collected in the smaller forward tank. Its wide-mouthed aperture will keep the contents emptying smoothly into any standard commode. The liquid tank will hold approximately four days use per person if used exclusively. A low-profile bottle is also available that holds about half the volume of the standard bottle. Additionally, the “Air Head” may be integrated with an existing holding tank system, creating holding capacity for both solids and liquids far beyond what many medium and small boat owners are used to. This is because the tanks take on no flushing water and are free to hold just what they need to.